"Our Mims was my best friend; she was everything to me," Jeanne Mirabito, founder of Our Mims Retirement Haven for thoroughbred broodmares, says. "It's almost unhealthy to love a horse that much." Our Mims was the Eclipse 1977 Champion Filly. But, her moment in the spotlight dimmed with time - long gone were the loving fans that cheered her onto her victories. Mirabito came upon her years later, alone and uncared for, grazing in a field with cattle. Left - Jeanne Mirabito with Timeless Sue at Our Mims Retirement Haven. Mims died December 9, 2003 far from the racetrack on Mirabito's farm, a peaceful place near Paris, Kentucky that fostered and cared for older horses. After dreaming about Mims one night, an email arrived the next morning from a friend saying that Sugar and Spice, Mims' younger sister, was badly in need of help and needed somewhere to go, and Mirabito just "knew" that Mims had given her this task to create the retirement haven. "When Mims died, my husband and I attended her burial at Calumet Farm's cemetery in Lexington," remembers Cheryl Bellucci, Director of Fund Raising at Our Mims Retirement Haven. (John Bellucci had created a sculpture of Our Mims necessitating numerous trips from Ohio to Kentucky to see and photograph her). Because there was some concern over how to pay for Mims' headstone, Mrs. Bellucci volunteered to lead a drive for her marker. "Fans donated items we sold on eBay, others donated, sent cards, notes...it was fantastic," she says. "When Jeanne started the Haven in Mims' name, I wanted to be a part of it, because the love Jeanne and Mims had for each other needed to live on." So began Our Mims Retirement Haven for broodmares in 2004, because the "ladies," as Mirabito calls them, deserve better. They risked their lives on the racetrack and then again foaling, some producing a foal every year.
" I've had mares on my farm that all together earned their owners $15 million in racetrack earnings and the sale of their first foals, yet they arrive here without a penny," Mirabito states. "More than 50 percent of the time, they've been neglected or treated just like livestock." Our Mims' main mission is to restore the health and spirit in aged mares who in their later years are never allowed to express themselves or regain their dignity. "Just because they aren't producing babies, doesn't mean they are useless," she explains. "They're amazing. It's not easy doing this, but I do it in honor of my best friend." As the mares age their dietary needs change, especially around the age of 25 when their bodies require more fiber to provide them with sufficient protein, so another of Mirabito's missions is educating the public about the elder equines' special nutritional requirements. "Some of these mares are snatched from a very sad ending. There is such a need for what Jeanne does," Mrs. Bellucci explains. "We could have three barns filled to capacity and an expanded budget, and the need would still be here...there would still be ladies waiting for a place. It's heartbreaking." Fourteen mares make Our Mims their home with 27 others on the waiting list. And, these ladies aren't shy when it comes to tying on the "feed bag." Every day they munch 150 pounds of food plus four bales of hay in winter, not to mention 10 pounds of carrots. And, Mirabito definitely sees they are treated like the ladies they are. When a mare turns 30 years old, her stall door is painted a regal purple. She sports a purple thermal blanket on winter nights and eats from a purple feed bucket. In fact, all the ladies have colored thermal blankets and painted stall doors representing their racing colors, if known. The mares have their own strict protocol too. They play in the morning, not in the afternoon. When Mims lived on the farm, her breakfast was served at dawn with supper promptly at sunset. (She was a champion after all, and with the presence of a true champion, knew if somebody was worthy of her attention...or not). Currently Timeless Sue is the boss and keeps the rules intact. If the ladies run through the barn aisle, Sue gets very mad and goes after them "with teeth" to make them behave. No boys allowed and no running in the barn - those are the rules. Smokie is the greeter on the farm and the oldest at 32. When a new horse arrives, she must graze outside the herd. Smokie joins her, grazes with her for a period of time that Smokie deems sufficient. And, only when it's time, does Smokie bring the new mare into the herd. "They just blossom here, because they don't have to worry about racing or their foals," Mirabito explains. 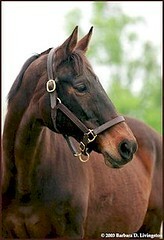 The oldest mare to live at Our Mims was Misty, a saddlebred/Tennessee walker, who lived to be 41! The rejuvenated mares remain safely at Old Mims until their time and are buried in the farm's cemetery. Mirabito learned from experience that these elder mares need time to mourn the passing of their friends. Once when a mare passed away, Mirabito found three of her friends all standing together in her empty stall. They were hanging their heads down, not eating. Mirabito left the stall door open so they could, at will, go in to grieve...and they got better. Now she makes certain the deceased mare's best friend goes in and occupies the stall. It helps. Mirabito proudly exclaims she's "the luckiest person in the world. I've owned two champions, 12 stakes winners and 10 stakes producers. Of course, I don't get them until they're 25, but they're not for sale - for any amount of money." To learn more about Our Mims Retirement Haven, to make a donation, or volunteer click here. Our Mims Retirement Haven is a 501 (c) 3 non-profit organization. To learn more about Our Mims herself, read her Tributes, racing history and more, click here. Left - Even the ladies' barn has a feminine touch with a row of painted sunflowers.